In today’s busy world where people find it difficult to allot time for their meals and also because of improper food intake, they may lack some of the nutrients required for the body. 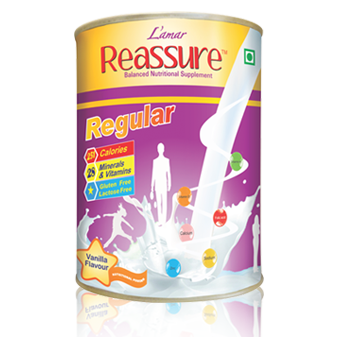 Reassure Regular is a complete nutritional dietary supplement which can be taken as a supplement in addition with the meals. It increases the intake of all the essential vitamins and minerals to maintain good nutrition required for the body. Hydrolyzed corn starch, corn oil, sucrose, sodium and calcium caseinate, MINERALS (Monopotassium phosphate, calcium carbonate, magnesium chloride, sodium citrate, potassium chloride, zinc sulfate, ferrous sulfate, manganese sulfate, cupric sulfate, chromium chloride, sodium molybdate, sodium selenite, potassium iodide), soy protein isolate, artificial vanilla flavour, soy lecithin, VITAMINS (choline bitartrate, ascorbic acid, niacinamide, alphatocopheryl acetate, calcium pantothenate, pyridoxine hydrochloride, thiamine mononitrate, riboflavin, Vitamin A Acetate, folic acid, biotin, phylloquinone, cyanocobalamin, vitamin D). Reassure Regular is a balanced nutritional supplement which increases the calories and nutritional supplements. This product helps in maintaining the vitamin and mineral levels in the body, thus, assuring a healthy immune system. To prepare a 250 ml feeding, put 210 ml of cold water in a glass. Gradually, add 6 level scoops (enclosed) or 55.8 g of Reassure Regular Powder, while stirring and mix until dissolved. When mixed as directed, Reassure Regular provides approx. 1 Kcal per ml. A 400 g can of powder yields approx, seven 250 ml servings. For flavour variety you may add standard food flavourings (chocolate, fruit, nut etc.). Also available in delicious Chocolate and Strawberry flavours. Copyright © 2016 Lamar Natural Products Pvt. Ltd.